Prepare the barbecue for indirect cooking over medium heat (180 to 230°C). If using a Weber Q barbecue, set up your barbecue with a convection tray and a trivet. 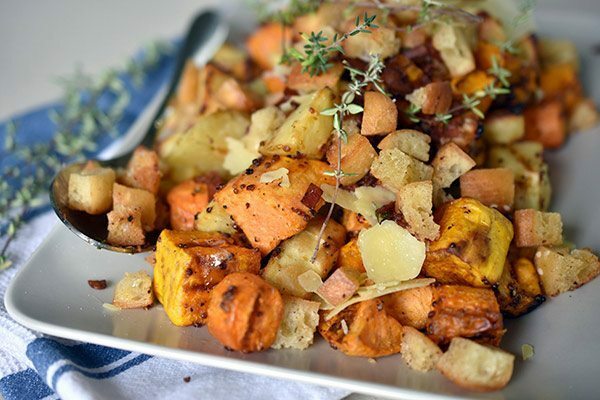 In a large bowl, combine the pumpkin, potatoes, sweet potato and carrots. Add the maple syrup, seeded mustard, olive oil. Toss to combine. Season with salt and pepper to taste. Roast the vegetables over indirect medium heat for 45- 50 minutes or until golden and cooked through. Whilst the vegetables are roasting, make the pancetta crumb. In a large frying pan on a side burner or stove top, fry the butter, crushed garlic and pancetta for 2 minutes. Add the ciabatta, thyme leaves and season with salt and pepper to taste. Fry for a further 5 minutes or until the pancetta is crispy and the bread is toasted. Pour onto paper towel to drain. Once the vegetables are cooked through serve on a platter. Top the vegetables with the shaved parmesan, pancetta crumb and garnish with fresh thyme.